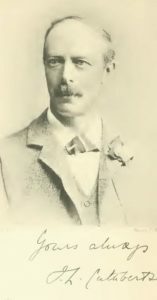 James Lister Cuthbertson was a Scottish-born Australian poet and much-loved school master. He was born on the 8th May 1851 in Glasgow. As he went through his school years at Trinity College in the Perthshire town of Glenalmond he had ambitions to join the Indian Civil Service. To achieve this he needed to pass certain entrance examinations which were available to him at Merton College, Oxford. Unfortunately he failed and had to seek a different career path. He saw opportunities for himself in Australia and followed his father there in 1874. Falsely claiming that he had gained a degree from Oxford, Cuthbertson managed to get onto the teaching staff at the Geelong Grammar School in the state of Victoria. He started teaching the classics while contributing poems to the School Quarterly magazine. His work was considered good enough for publication and his first collection came out in 1879 under the title Grammar School Verses. Perhaps conscience got the better of him and he returned to England briefly to complete his degree studies, gaining a BA in 1885. He then set sail for Australia once more, rejoining the Geelong staff. Some literary critics have judged his work to be of a relatively low standard but he still managed to secure a place amongst the best of the Australian 19th century poets. His simple, restrained style certainly had some appeal. After losing his place at Geelong he visited his mother in England for a time before going back and maintaining contact with the school, a place where he had been a popular schoolmaster, enjoying special relationships with the boys under his care. He achieved a great deal of success there, as evidenced in the achievements of many of the students who had been influenced by his teaching. He was instrumental in putting in place the school quarterly magazine and the adoption of a prefect system for the students. He got involved in the sporting side as well, ensuring that the school acquired a cricket ground and a boatshed for those interested in rowing, amongst other vital facilities. He never married and lived a fairly simple life of writing, fishing and occasionally working as a journalist. On one trip to Mount Gambier towards the end of 1909 he fell ill and tried to cure himself with a barbiturate called veronal. He barely slept for three weeks and, perhaps accidentally, took a fatal overdose of veronal.